Be sure to watch Mike perform his air show on Wednesday, Friday and Saturday. ALL DAY Extra 330SC Show Plane on Display at Hartzell Booth Display is in between Hangar A and the food court. Booth #s 296-297. 12:00 PM - 12:45 PM Hartzell Booth - autographs Display is in between Hangar A and the food court. Booth #s 296-297. 10:00 AM - 10:45 AM Lycoming Booth - autographs At the big tent, just west of Boeing Plaza on the main road. In front of Hangar A. Booth #s 277-282. MORNING Extra 330SC Show Plane on display at Lycoming At the big tent, just west of Boeing Plaza on the main road. In front of Hangar A. Booth #s 277-282. 10:00 AM - 10:45 AM Lycoming - autographs At the big tent, just west of Boeing Plaza on the main road. In front of Hangar A. Booth #s 277-282. The Goulian team and a display of Whelen products will be at our Hospitality & Exhibit Center. 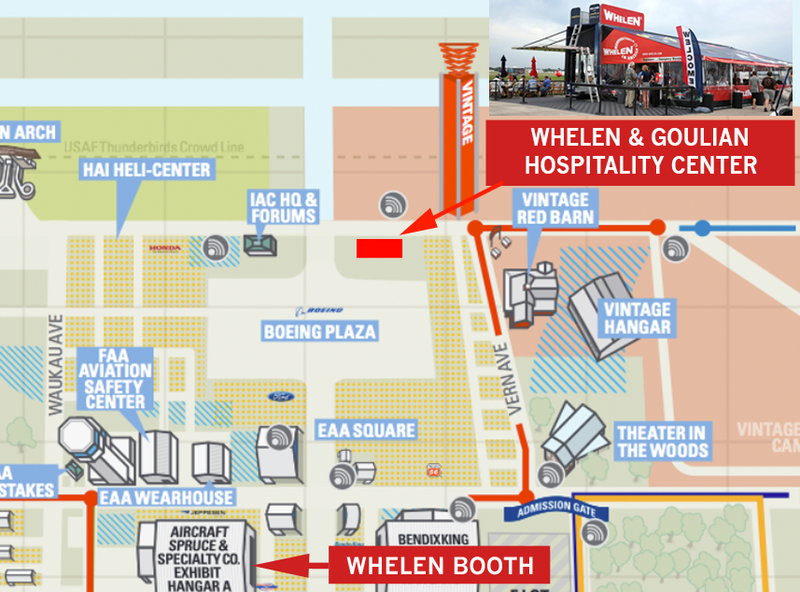 The Whelen technical team will be in Hangar A at their booth #1088.